Gardening is creating with plants, whether they are flowers, vegetables or herbs. And making your gardening arrangements unique and artistic just adds to the fun and your backyard garden areas. A Tilting Clay Pot Garden saves space so is perfect for apartment dwellers, balconies and small patios. It also makes a great garden accent or focal point. And its fun to create! You will need a pot stand that should stand 5 to 6 foot tall. It can be wood or metal, but I myself prefer metal because the pots will be heavy once filled with soil and plants. It is possible to buy a stand at a garden center but it’s just as easy to assemble one. You can use a strong dowel (mop or rake handle works well) or rebar. You can pick a piece of rebar up at a junkyard. An old section of metal pipe will also work. If you use a straight dowel or bar, you must drive it into the ground about one foot. To build, insert the pot stand into the first pot. I usually us a 12 inch pot as the bottom pot. Fill the pot half way with rocks and gravel. This will weight the pot down and add stability to your Clay Pot Garden. Add soil and pat the soil in place. Next, place your second clay pot on the rebar pole. Turn the second clay pot in the direction you want it to face and fill the pot with gravel, rocks and potting soil. Continue this process until you have all six pots in place. As you create you clay pot planter the clay pots should get a little smaller. It just has a better look this way. Also rotating the direction of the pots add interest and more color once the pots are filled with plants. 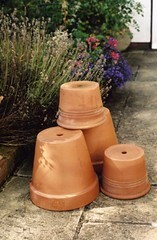 Once all the pots are in place and filled with soil its time to plant your plants. This planter look great with any plant variety and can easily be changed each year or even each season by changing the plant selection. Flowers, herbs, a mini garden and a mixture of all are equally beautiful. I will suggest a vine in the bottom planter that will vine up the pole and add more color and greenery to the planter. An herbal spice kitchen garden works well if located near the kitchen door. And the very popular Pizza garden or Barbeque herb garden works well too. Water this planter from the top down. Water very slowly, making sure the water soaks slowly into the soil, especially the first couple of times you water. The plants need time to get established in the pots. If you water too quickly, the water will just run over the side of the pot before soaking in! I quite often will lightly mist the planter before I water the planter. It seems to help set the soil. One other addition to this planter is to give the planter an aged look by mossing the pots. This process is called The Moss Milkshake Method. It adds interest and an artistic look to the planter.